How to tie Fishing Knots? 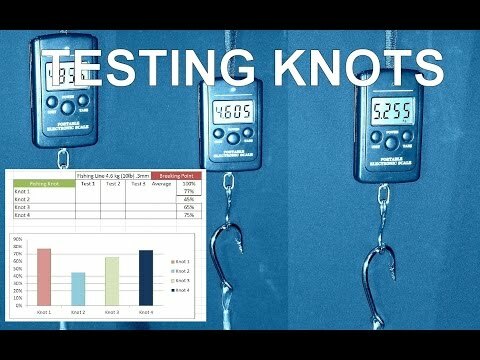 : Improved Clinch knot vs Clinch knot breaking strain tests! How many times has it happened to you guys that you snag and brake your fishing line and you want to tie a new hook to as fast as possible to continue fishing because every second that you're out fishing and you are not fishing is a huge loss! You are rushing to tie a fishing hook to a line and your hands are dirty, no luck. The weather is changing and you are trying to setup your fishing rig. You are tying your swivel and you made a Clinch knot but you don't have a long enough tag end to make one more tuck at the loop and it comes to mind that it's the same thing it's going to hold enough with or without the extra tuck. Is it worth it to untie and tie again? We are going to find out the answer very soon. In this article we will see fishing knots strength comparison,chart and table of two fishing knots, Clinch knot and Improved Clinch knot. We will compare them to see which one is better and is the Improved really more reliable than the ordinary Clinch knot. In this testing we want to avoid any possible human influence in the test, so that means we will use standardized knots. All fishing lines are cut before tying fishing knots, every single one of them will be the same length and it will be tied the same way which means the same number of loops. Fishing video with our test on the Clinch and Improved clinch fishing knot. Here are the results of the tests. The results are a little bit shocking for me and I expected much better results from both, at least 20%. Clinch knot broke three times at 2.575 kg , 2.410 kg and 2.185 kg which gives an average breaking point of 2.390kg which is only 52% of the full line capacity! Improved Clinch knot broke three times at 2.825 kg, 4.080 kg and 3.735 kg which gives us an average breaking point of 3.547 kg which is 77% of capacity of the fishing line. The Improved Clinch knot is stronger 48% which is amazing to know. The Clinch knot has a problem with slipping when it's exposed to high tension and your tag end is gone in seconds. So don't be lazy when you tie your swivel, hook or lure, do one more step: tuck the line through the last loop. If you don't have a long enough tag end, do it from the beginning. Remember what you read here and maybe you will hook your dream fish and you don't want to lose it because of a knot.